To compare the humeral retrotorsion (HRT) among non-athletes, amateur swimmers and competitive swimmers and to analyze the relationship between HRT and swim volume in competitive swimmers. Ninety children and adolescents, both genders (30 non-athletes: 11.50 ± 1.94 years; 30 amateur swimmers: 11.56 ± 1.81 years; and 30 competitive swimmers: 12.63 ± 2.02 years). HRT measurement through the bicipital forearm angle (BFA), by palpation, using an inclinometer to obtain the angle. Competitive swimmers showed lower BFA (higher HRT) compared to the amateurs (mean difference: 8.3°; p = 0.013; effect size: 0.82) and to the non-athletes (mean difference: 8.5°; p = 0.010; effect size: 0.80). A significant fair negative relationship (r = -0.37; p = 0.04) was found between BFA and volume of swim. Competitive young swimmers present increased HRT and a higher volume of swim is associated with a lower BFA (higher HRT) in these athletes. These results can help to improve the understanding of osseous adaptations in young swimmers. Swimming (like doing any repetitive motion) during puberty results in joint adaptation. 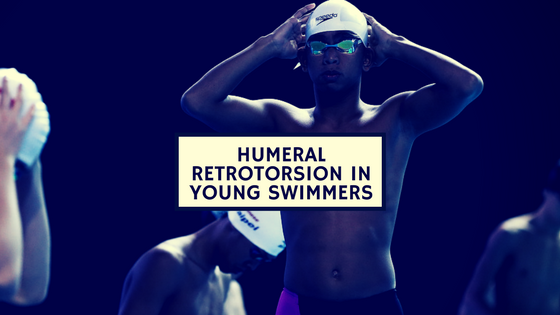 In swimming, like other overhead sports, humeral retrotorsion occurs due to an adaptation of repeated overhead arm stroking. What this means is unclear, but may be an injury risk, despite being a swimming mechanical advantage.